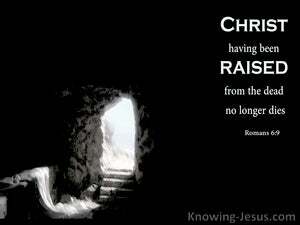 because we know that Christ, having been raised from the dead, no longer dies. Death no longer rules over Him. for we know that the Messiah, who was raised from the dead, will never die again; death no longer has mastery over him. knowing that Christ, having been raised from the dead, dies no more. Death no more has dominion over him. knowing that Christ being raised from the dead dieth no more; death no more hath dominion over him. Because we know that Christ (the Anointed One), being once raised from the dead, will never die again; death no longer has power over Him. We know that Christ was raised from the dead, never to die again, because death does not have control over Him any longer. Having knowledge that because Christ has come back from the dead, he will never again go down to the dead; death has no more power over him. 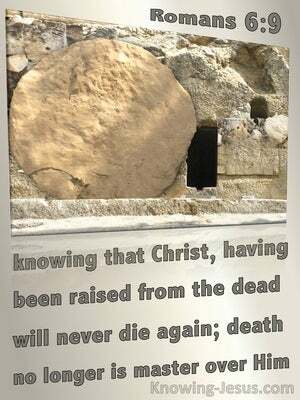 For we know that Christ, being raised from the dead, will never die again; death no longer has dominion over him. knowing that Christ being raised from the dead, is to die no more; death hath no more dominion over him. knowing that Christ having been raised up from among the dead dies no more: death has dominion over him no more. knowing that Christ having risen from the dead dies no more; death no longer has dominion over him. for we know that Christ, once raised from the dead, will never die again; death has no more hold on him. 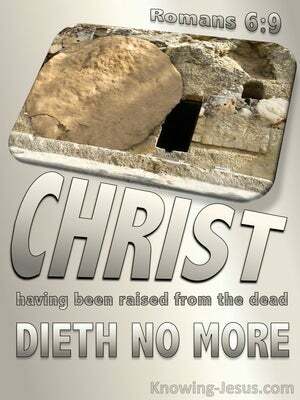 Knowing that Christ being raised from the dead, dieth no more; death no more hath dominion over him. knowing that the Christ, having been raised from the dead, dies no more; death has no more dominion over him. Knowing that Christ, raised from the dead, dies no more; death has no more power over him. Knowing that Christ being raised from the dead dies no more; death has no more dominion over him. 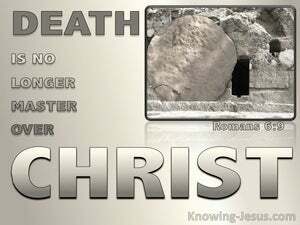 knowing that Christ, [because he] has been raised from the dead, is going to die no more, death no longer being master over him. knowing that when Christ was raised from the dead, He dies no more; death no longer has dominion over Him. remembering that Christ, once raised from death, dieth no more. Death hath no more power over him. knowing that Christ, being raised from the dead, dies no more; death has no more dominion over him. We know that since Christ has been raised from the dead, he is never going to die again; death no longer has mastery over him. knowing that Christ, being raised from the dead, dies no more. Death no more has dominion over him. since we know that Christ, having been raised from the dead, dieth no more; death hath dominion over him no longer. knowing that Christ being raised from the dead dies no more; death has no longer a lordship over him. knowing that Christ being raised from the dead dieth no more; death over him hath no more dominion. We know, indeed, that Christ, having once risen from the dead, will not die again. Death has power over him no longer. Knowing that Christ, being raised from the dead, dieth no more; death hath no more dominion over him. 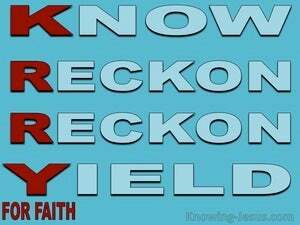 because we know that Christ, having come back to life, is no longer liable to die. for we know that Christ, who once was raised from the dead, will never die again; death has no more power over Him. knowing that Christ, being raised from the dead, dies no more. Death no more has dominion over him! 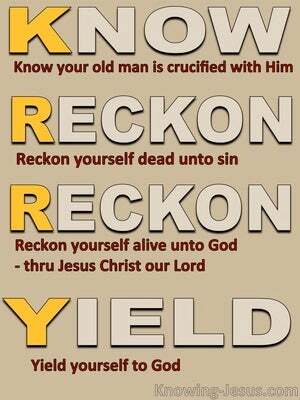 knowing that Christ, having been raised from the dead, dieth no more; death no more has dominion over Him. 8 Now, if we have died together with Christ, we believe that we shall also live together with him; 9 Knowing that, Christ having been raised from among the dead, no more dieth, - death, over him, no more, hath lordship, - 10 For, in that he died, unto sin, died he once for all, but, in that he liveth, he liveth unto God. and the Living One, - and I became dead; - and lo! living, am I, unto the ages of ages, and have the keys of death and of hades. Whom, God, raised up, loosing the pangs of death, inasmuch as it was, not possible, for him to continue held fast by it. 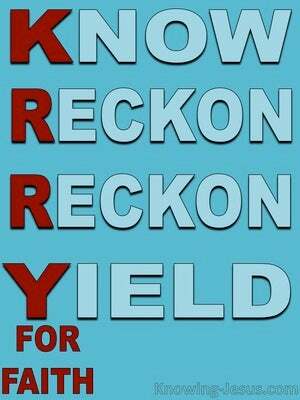 For, sin, over you, shall not have lordship, for ye are not under law, but under favour. Whence he is able, even to be saving unto the very end, them who approach, through him, unto God; Since he evermore liveth to be interceding in their behalf.